We just arrived. And it’s colder and wetter than we had expected at this time of year. We don’t understand a word that’s spoken. And our gmail doesn’t work, nor can you google anything. But we ventured out of our hotel on foot for a quick look around the neighborhood. While the characters are in one language, the food is not something you would typically expect in this country. The walnuts are the most ginormous you have ever seen, and the fresh pomegranate juice is to die for, while the dried fruit is abundant and dirt cheap. There was no pork in sight, but the aromas of lamb were intoxicating. 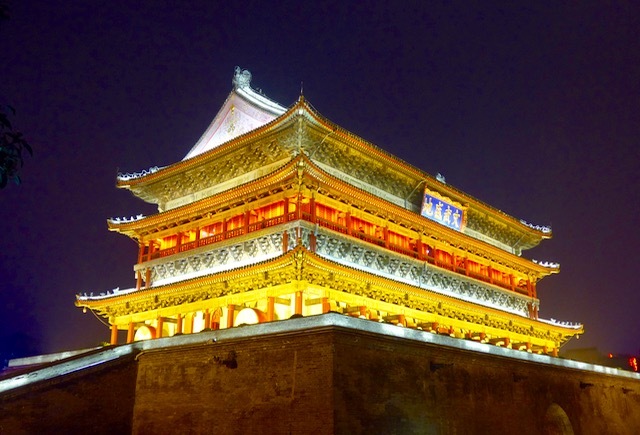 China Silk Road, City of Dun Huang, or Xian ? Close to Mongoliad Desert? Shaanxi or Xinjiang province, China? Am jealous! Just a stop over? Looks like the street food would be interesting. 1st pic was Drum Tower of Xi’an; 2nd pic was the unforgettable Xian Muslim Market, where you can have the most delicious persimmon cake, flaky hopia with various filling (love the walnut/essence of rose), mochi (steamed like puto bungbong), lamb bbq/fruits on stick and best mutton soup… all very inexpensive except the hopia. One of the best food trips (plus Beijing peking duck) we had! Xian. 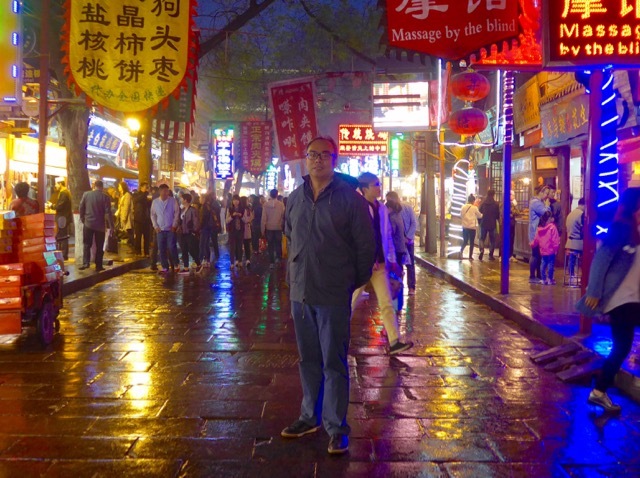 The other picture is taken in the muslim quarter in Xian. Yummy street food. Xian. Lots of happy memories with colleagues, some of them local Muslim, who took us to their favorite restaurants. Not what immediately comes to mind as typical Chinese food. When are you off to the terracotta warriors? Looking forward to the food entries! Yey! The name of the place I forgot, I only remember the people because of the unique pronunciation and its potential in Scarbble™. Glad to learn you finally made it to China and gladder still to find out that what you’ve seen so far seems to reignite your food blogging mojo. Knew all along that it’s just a matter of time till you book a courtyard suite at Aman’s Summer Palace Beijing. Learn to say “tài guì” to the agressive hawkers in Xi-an. The tea fields near Amanfayun are supposed to be spectacular as well. I too skipped the Great Wall (well, not literally) but there is simply no way around the Collections of the Palace Museum whether in Beijing or Taipei. IMO, the Great Wall was one of the most fascinating sights we’ve been to. I think the trick is to go through a less touristy section, in our case we went to Mutianyu and not to popular, crowded Badaling. Agree with Nina. Great Wall is an amazing site to see. Dont go to Badaling. Thats where all the tourist go. Go to Mutianyu. Its a trek up to the cable cars that take you up but the cool thing is you can go down via luge. Glad to hear,see more elaborate posting I follow you on Instagram but I love it here better.